A stud farm is where it all begins. This is your first step on choosing your potential new champion that you aim to get to a track. Breeding is so important and research is absolutely vital. One of our favourite studs is Vinery Stud. Situated in the Segenhoe Valley just five minutes from Scone is one of the most ideal thoroughbred nurseries in Australia. Last weekend the doors opened in the Upper Hunter to view all the current stallions and Thoroughbred Events Australia had our scouts out and about. Thank you Robyn Fowler. Vinery Stud provided a beautiful morning for their Stallion Parade. After a night of much needed rain to the area the morning was saved for a dry event. Bacon and egg rolls, mouth watering pastries, coffee, champagne and orange juice were being consumed on the lawn before the parade began. 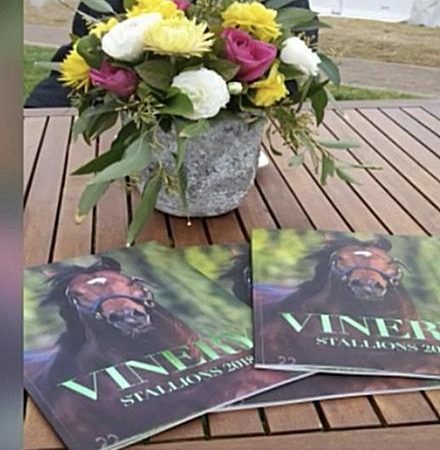 Vinery Stud showcased all of their 2018 stallions on. The parade consisted of PLUCK, CASINO PRINCE, ALL TOO HARD, PRESS STATEMENT, STAR TURN, HEADWATER and the magnificent MORE THAN READY. Thank you to Vinery Stud for presenting a fantastic Stallion Parade and please take the time to watch our video of the morning.